Ask Baba Yaga: How Do I Know When To Let My Heart Guide Me? How do I know when to focus, and when to let my heart guide me? It can sometimes get lost. Yr heart is a bloody organ without eyes, limbs, or smell. All it knows is heaviness & lightness, the movement of liquid, & its own music. Yr heart will know when you are moving too quickly or slowly, when you are carrying a great weight, and when yr body is an ugly song. ; Know what yr heart is, and do no ask of it what it cannot do. Previously: Is It Possible To Truly Love My Partner If I Know I Could Do Better? Taisia Kitaiskaia is a poet and writer living in Austin. She’s taking questions on behalf of Baba Yaga at askbabayaga [at] gmail.com. 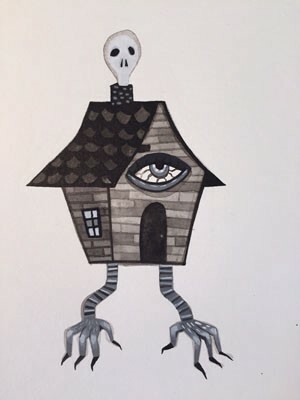 Illustration of Baba Yaga’s hut by Katy Horan.